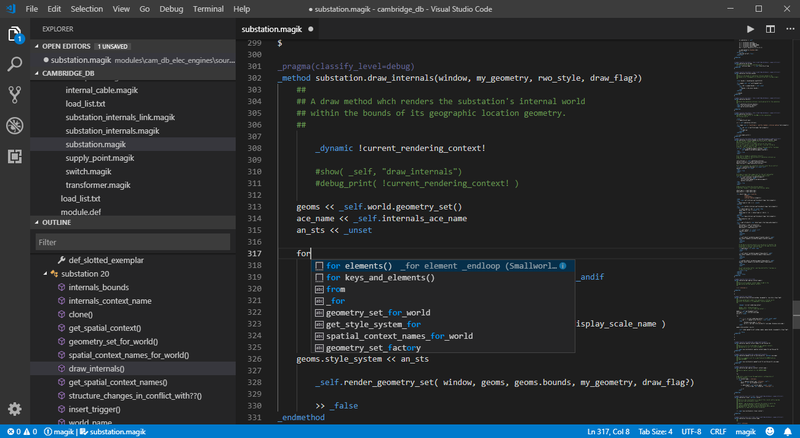 Visual Studio Code>Programming Languages>Smallworld MagikNew to Visual Studio Code? Get it now. 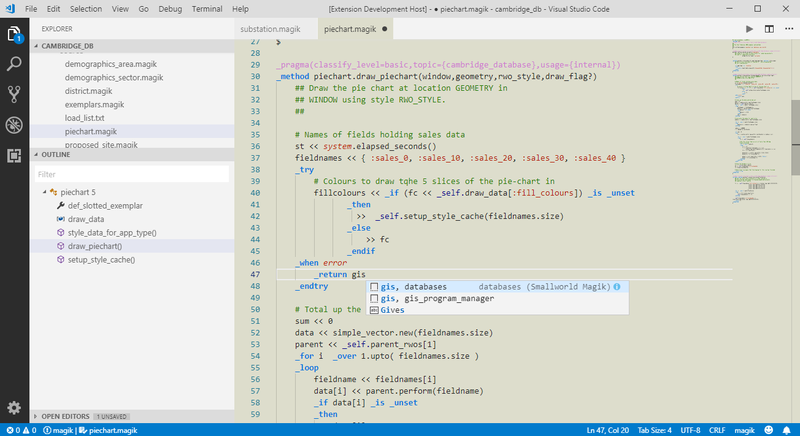 This is a fast and modern IDE for Smallworld application development and Magik programming language. Language grammar for Magik, gis_aliases, product.def, module.def, and message files. IntelliSense and auto-complete for Magik code and popular Smallworld commands. Symbol Provider for Magik and gis_aliases contents. Compile Magik code into a Smallworld 5 session (not supported on Smallworld 4). Open a Smallworld Product folder, or click on a Magik source file to activate this extension. Open a Magik file to see the code outline for Objects and methods in the file. 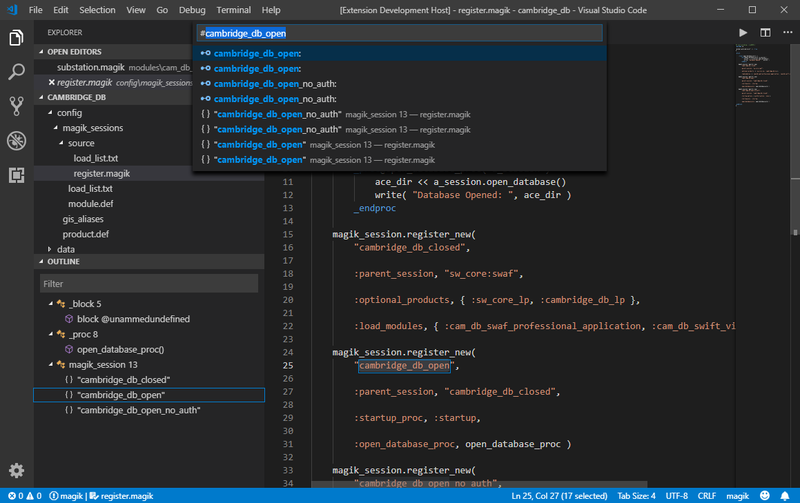 Start typing Magik code to get keyword autocorrections and autocomplete features. open the Symbol browser by CTRL-T and see a list of Object Exemplars, Methods, and Procs in the entire product tree, and click to jump to a definition. Change the colour Theme to Smallworld Magik to get a traditional Light theme. Set the Smallworld gis.exe path in the settings and setup optional starup batch commands to run before the gis.exe. Open a gis_aliases file, the stanzas appear boxed in Orange and have Code Actions (Yellow light bulb). Click the Light Bulb to get the command to Start a Smallworld Session. An 'environment.bat' in the same path as gis_aliases will automatically be loaded. 'F2 s' or 'Alt+F9' to compile the current code selection. Access Class or Method refrences in Hover Actions over 'object.method' definitions. Open File-Preferences-Settings, expand Extensions - Smallworld GIS and click on "Edit in settings.json". Add the "Smallworld.gisPath" entry for Smallworld gis.exe path. Use double backslash '\' or single forward slash '/'. Example: "Smallworld.gisPath": "C:/Smallworld/core/bin/x86/gis.exe"
Session startup batch commands to run before gis.exe. Document Symbol Provider and Workspace Symbol Provider for supported extensions. Magik autocorrection bug fixes and performance improvements. Improvements for Magik syntax colouring, supporting all complex forms of Magik Symbols. Basic support for Smallworld Magik source and resource file types, including Symbols and Autocorrection.